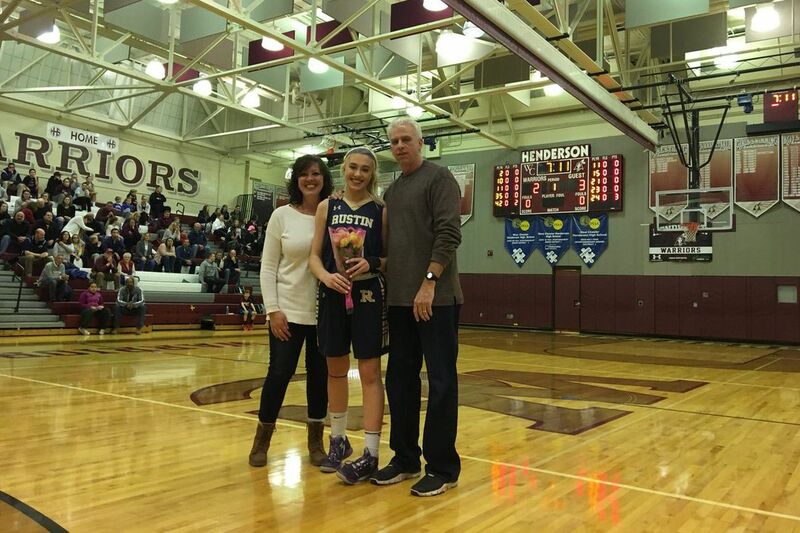 West Chester Rustin’s Maggie O’Hare scored her 1,000th point on Thursday. Maggie O'Hare reached 1,000 career points on Thursday, but the West Chester Rustin girls' basketball team lost to West Chester Henderson, 52-46, in overtime. O'Hare ended with 14 points for the Golden Knights. Erin Thompson led Henderson with 16 points. Mandy McGurk recorded 20 points and eight steals as Notre Dame outlasted Penn Charter, 51-45, in overtime. Riley Gillin made a game-tying basket in the final seconds of regulation for the Irish, who went 20-for-22 from the foul line. Springside Chestnut Hill held off Agnes Irwin, 48-34, thanks to 20 points from Mo'ne Davis. Nyaim Smith's three-pointer with 1.8 seconds left gave Paul Robeson a 51-48 win over Fels. Troy Butler finished with 19 points, 14 rebounds, and five assists for the Huskies, who won the Public League National Division with a 12-1 record. Korey Stewart filled the stat sheet with 32 points, 15 rebounds, seven steals, five assists, and four blocks as Masterman beat KIPP DuBois, 79-75. Stewart scored 12 points in the fourth quarter. Sincere Pratt notched 21 points, five assists, and five rebounds in Bodine's 62-42 victory over Esperanza. Andre Davis made five three-pointers en route to 23 points as Parkway Northwest defeated Edison, 89-76. Marquis Moore and Vernon Garvin added 22 and 20 points, respectively. Nathan Rodriguez had 44 points for Edison. Devon Brewster scored a game-high 40 points, but Solebury School fell to Pennington, 89-85, in overtime. Sam Sessoms made eight three-pointers en route to 42 points as Shipley cruised past Chester Charter, 82-45.